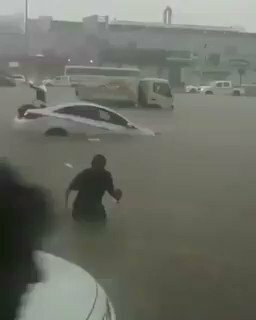 Heavy rain is wreaking havoc across Jeddah, Saudi Arabia on Tuesday, November 21, 2017, stranding drivers on flooded roads and delaying school classes at least until Thursday. The Centre for Crises and Disasters in Makkah Region closed a number of roads in Jeddah on Tuesday due to heavy thunderstorms accompanied by active winds that limited vision, Gulf News reported. The National Centre for Security Operations at the Ministry of the Interior received 10 902 calls by "911" operations in Makkah from the beginning of the rain until noon on Tuesday. The center said that most of the calls were to inquire about the roads and streets that could be used for traffic and added that the Civil Defence dealt with 241 rescue cases. Several flights were delayed this morning, Saudi Airlines said. Passengers were told to contact airline companies for more information. The education district in Jeddah and Makkah shut down schools and colleges ahead of the storm, saying they won't reopen at least until Thursday, November 23. The Directorate of Civil Defense warned residents to strictly avoid going down to the valley or approaching floodwaters. "Move away from places that are usually flooded and avoid going near wadis and riverbanks."